The libpic170x modular toolbox that is intended to make using or implemeting certain features of a PIC microcontroller less painful. It either gives a basis to work off, or provides a modular library to build an application from. The library was developed for the PIC16(L)F1705 and PIC16(L)F1709 microcontrollers. It is likely that the library will not work with other microcontrollers. Please refer to the Usage section for details on how to use the library. This library is licensed under the Apache License, Version 2.0. See the the attached LICENSE.md file for details. Example implementations showcasing the different libraries, can be found on the examples page. Using the library as inlined sources is most likely the most useful way of using the library since the library uses preprocessor macros to compile certain library settings directly into the library to save program memory. Using the library as inlined sources is most likely the easiest way to use the library. Just copy all the source files for libraries that you would like to use into your your project and compile them yourself. There are not many things to consider. You only need to define _XTAL_FREQ to match your desired processor frequency and you are ready to roll! This library is compiled for a PIC16LF1705 micro controller running its main processor clock at 2 MHz. The sources for libpic170x contain a convenience bash-script with the name build_all.sh which will build all supported combinations of chip and frequencies in one go. Alternatively, if only one parameter set must be built, it is possible to control which library is being built by defining the make variables chip and xtal_freq and setting them to the apropriate parameters. Example: make chip=16LF1705 xtal_freq=8000000 will build libpic170x_16LF1705_8000000.lpp. Add _XTAL_FREQ compiler definition matching the library build flags. Then your are set. For a working example, check the blink-demo application from the examples-directory. The dependency tree indicates what headers nad libraries are required to be included for usinga given feature. 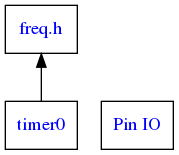 freq.h forms the basis for all other libraries since it defines important timing constants for all other libraries, so it must always be available. For all other libraries all direct and indirect dependecies must be available for the library to function.